In its second major deal of the month, Paris-headquartered language service provider (LSP) Technicis buys Belgium-based rival Telelingua. The terms of the acquisition have not been disclosed. Founded in 1985, Telelingua was owned by CEO Jean-Didier Boucau and his family (99%) and management (1%). According to an email interview with Technicis CEO Benjamin du Fraysseix (pictured), it has not been decided yet whether Boucau will stay on in the combined organization. Just weeks ago, Technicis, which is majority owned by French private equity firm Naxicap, alongside CEO Benjamin du Fraysseix, bought fellow French LSP HL Trad in a deal that lifted Technicis’ pro-forma annual revenues to nearly USD 80m. Now, with Telelingua joining its ranks, Technicis is adding around USD 35m to its top line (based on 2017 revenue), meaning the company looks set to comfortably break the USD 100m mark in 2018 and more than double revenues from the USD 52.8m it generated in 2017. This latest acquisition will propel Technicis up the Slator Language Service Provider Index (LSPI), as it surpasses the likes of thebigword (USD 80.6m), Ubiqus (USD 82.6m) and likely even Semantix (USD 106.9m) in terms of pro-forma annual revenues. Telelingua itself stands at #29 on the Slator LSPI for its 2017 revenues, and achieved 18% year on year growth from 2016. 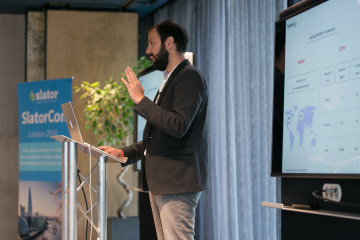 Technicis CEO Benjamin du Fraysseix said that Telelingua’s 2017 growth was thanks to “a new line of business into some big client accounts”. 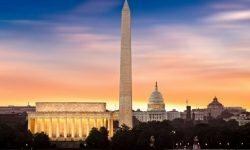 He also says that the company is a “great match” for their group in part because of its geographical footprint, which includes offices across Europe and in New York as well as a 50/50 joint-venture with Bright Translation Services (BTS), which is based in China’s fast growing tech hub Shenzhen. With the deal, Technicis is also adding to or complementing its client portfolio in terms of industry verticals. Telelingua brings customers in Life Sciences, IT & SAP, Finance, Legal, Energy and Environment. Technicis will take on Telelingua’s 250 full-time staff, taking the joint company headcount to around 700 people. Technicis is planning a rebranding in September 2018, bringing the group (with the exception of Textmaster) under a single name. As to whether Telelingua will also be part of the rebranding, du Fraysseix said that nothing had been decided yet. Asked if after Textmaster, HL Trad and now Telelingua, he is going to take a break from deal-making and focus on integrating what is becoming a diverse group of LSPs, du Fraysseix said that there will now come a time of “strong focus on consolidation”. So at least for 2018 it seems Technicis may be taking a breather from further major acquisitions. Parties involved in the deal for Technicis were JSQUARE Conseil on M&A, Exelmans for financial advisory and Villechenon for legal. For Telelingua, Deloitte acted as M&A and financial advisors, and Philippe Hamer was the corporate lawyer. The acquisition was financed through a mix of equity and debt. Meanwhile, consolidation among the larger language industry players has accelerated considerably over the past few days with SDL’s acquisition of Donnelley Language Solutions announced on July 16, 2018 and eCommerce company THG’s acquisition of Language Connect announced on July 17, 2018. For expert analysis and a full list of all deals covered on Slator including price, earnings or revenue multiples paid where available, sector, country, type, and more, download the Slator 2017 M&A Report. 16-page report. 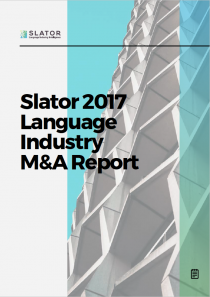 Analysis of 2017 language industry M&A, 2018 outlook, list of all deals Slator covered incl. price, multiples if available, sector, country, deal type. Register now for SlatorCon San Francisco and join the M&A discussion from a US vantage point.